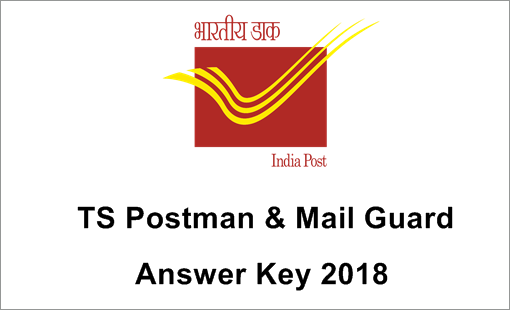 TS Postal PM & MG Answer Key 2018: Telangana Postal Circle has organized Postman/Mail Guard examination on 17th June in many districts of Telangana. Many of the hopefuls seeking to get Telangana state government jobs have attended the Telangana Postman/Mail guard examination. The examination has been organized in a massive number of examination centers in the state. All the competitors are hereby informed that the TS Postal Circle Postman/Mail Guard answer key for 17th June examination will be shortly accessible to download on TS Postal Circle official website, telanganapostalcircle.in. the answer key/question paper solutions will be released in form of PDF format. Aspirants competed for TS Postal Circle Postman/Mail Guard examination can download the answer key and compare with the matching set in set A, B, C, D to estimate the score in the examination. Visit the TS Postal Circle official website to download the answer key and to estimate the score. Telangana Postal Department is the state level department to carry out various postal needs. It annually announces various job notifications for the aspirants seeking jobs in Telangana. The Postal Circle, Telangana had issued recruitment notification for 136 postman and mail guard posts this year. Many of the eligible aspirants have applied for the Telangana Postal Circle jobs. The application process was carried out recently for the announced posts. The TS Postal Circle has accepted applications from eligible and interested candidates from 22nd March to 21st April. The Telangana Postal Circle is going to shortlist the suitable candidates through the written test and interview rounds. Applicants initially need to qualify the written test to select for the next round. The Telangana Postal Circle has conducted the written test on 17th June in morning and afternoon sessions. A huge number of hopefuls have competed for the TS Postal Circle Postman/mail guard examination. The Telangana Postal Circle is expected to release the TS Postman answer key after 10 to 15 days of the examination. Candidates appeared for the test on 17th June can download TS Postal Circle Postman answer key for both morning and afternoon sessions. The answer key/question paper solutions for all sets A, B, C, D will be accessible to download @ telanganapostalcircle.in. Visit the offiical website and download the TS Postman answer key to estimate the correct answers and hence by estimating the probable score in the examination. Final Answer Keys have been published. Candidates competed for the test need to get the minimum cutoff marks/qualifying marks to clear the examination round. The TS Postman category-wise cutoff marks are listed as follows. The competitors can check to know whether they can clear the written test round or not. Candidates can expect the postman/mail guard results after a month of the examination (approximately). The department will usually announce the results within 3-4 weeks after the examination(approximately). Candidates can stay checking the Telangana Post official portal for latest updates regarding the results. Along with the results, the organization also will announce the TS Postal circle postman/mail guard cutoff marks. Candidates scoring the required cutoff marks in the examination are said to be qualified in the test. Candidates who qualify the written test round will get the access to take part in further rounds of selection process. Telanganapostalcircle.in – Is the official portal of TS Postal Circle. Have a look at the page. TS PM/MG Answer key 2018 Link appears in this section. Click on the link. I got 45 marks i am sc if there any chance to get job? I am OBC and got 85 in recent PMMG in Hanamkonda Division. Is there anybody belongs to Hanamkonda Division?? Reply Me. I am sc candidate nd i got 73 marks hyd city div .Is there any chance to me? sujatha college for women situated at abids, collected the OMR duplicate sheet also. So how the students will cross check there answers. 89 st city division any chance guys? I got 92 south east zone. If any one get more than 90 plz share…..
Book let series_A. Question number 84 option A correct kadhaa Mari key lo B ani echaru please tell. Objections block open ayindi….but objections icchi, proof kuda upload cheyamantunaru kada….proof ante manam okay paper meda explanation rasi pic upload cheyocha….Please tell me….